support: One of the most intimidating naval displays on earth. "What reason could the United States have, to send such a powerful naval force to a region at peace, without nuclear weapons, without conflict or any real military threats? … Vast control of the interior of Latin American territory." 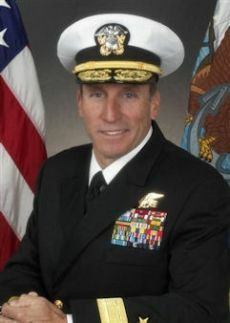 Rear Admiral Joseph D. Kernan, recently commander, Naval Special Warfare Command, is the new commander of the reborn Fourth Fleet. He will be responsible, according to the U.S. Navy, for ships, aircraft and submarines operating in the Caribbean, and Central and South America. No world power takes important decisions without there being great motives behind it. In April, the United States announced that tomorrow, July 1st, after 58 years of inactivity, the Fourth Fleet of its powerful Southern Command will again begin to patrol Latin American waters, this time under the command of Rear Admiral Joseph Kernan. The resume of Kernan, who until now has been the supreme commander of the Naval Special Warfare Command, is no less worrisome. The Marine belongs to the SEAL group, an elite commando unit with men selected for the most grueling special operations. They are prepared to act under the most exacting and adverse conditions, almost always intervening in isolation from their command or other units. They operated in Vietnam, Cambodia and Laos. The choice of Kernan for the Fourth Fleet, even the Pentagon admits, is highly unusual. It's the first time that a SEAL has held such a post. What's more, with this decision, the Southern Command has achieved the same level of importance as the Central Command, which operates the Fifth Fleet in the Persian Gulf. 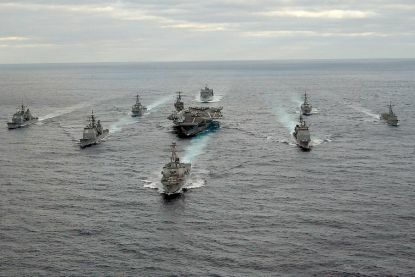 What reason could the United States have, to send such a powerful naval force to a region at peace, without nuclear weapons, without conflict or any real military threats? “They're never going to admit that it's because of our natural resources, but it's no coincidence that this decision comes just as a structural change is underway in the global economy, in which reserves of fresh water, food and energy resources (which our region has in abundance) have assumed such vital strategic value,” said Clarín Khatchik Der Ghougassian, specialist on security issues at the University of San Andrés [Argentina]. The professor believes that there are two principal motives: natural resources and the emergence in Latin America of so-called “populist” governments, which appear increasingly on the security agenda every day. The Pentagon's stated objectives are to interact and train other navies to battle illicit trafficking, collaborate with humanitarian aid in cases of natural disaster and to keep trade routes free and open. They don't hide the immense importance that the Western Hemisphere's southern seas - and the Pentagon admits that its capacity for taking action will be strengthened with the Fourth Fleet overseeing the ships and planes (civil and commercial) that navigate south of the United States. For the moment, the Fourth Fleet will include no new units: it will begin with 11 ships and one aircraft carrier. But other statements show clearly that the objectives of the United States are broader and involve a worrying penetration into Latin American territory. James Stavridis, currently Chief of the Southern Command, added Narco-trafficking, the fight against terrorism and the possibility of having to respond to a massive migration of refugees from countries like Haiti or Cuba. And James Stevenson, Commander of the Navy's Southern Command, explained that their ships will even traverse the huge river systems of South America, sailing in brown water rather than the traditional blue. In other words, a vast control over the interior of Latin American territory. The Southern Command made use of the idea of social activities like handing out food or medicine, allowing them to convince the U.S. Congress that this penetration is justified. But there are other ways to read this. There is a leader, Hugo Chávez, who is making life complicated for them. And there is a country - Brazil - with plans for leadership that isn't necessarily opposed to the U.S., but rather takes power away from it, observes Clarín Ruth Diamint of the Universidad di Tella. Let's suppose that UNASAR [the Union of South American Nations ] and the South American Defense Council begin to function, and instead of turning to the historic link with the United States, our Armed Forces turn to a more “intra-South American” model. In that scenario, a strong U.S. military presence is a deterrent. I believe the likelihood of the U.S. invading the Amazon or Guaraní Aquifer is very remote, although not absolutely impossible. But in judging by the militaristic reading that the U.S. has of reality today, whenever it confronts any type of uncertainty or confusion, there appears a military response. If Obama wins, both specialists agree; there will be few changes - since these policies are plotted out for the long haul. Both Venezuela and Brazil reacted to the news. The commander of the Navy of Brazil, Julio Moura Neto, made it clear that his country will not under any circumstances accept any American naval intervention in Brazilian waters. After analyzing Pentagon documents, Mexican researcher Ana Esther Ceceña concluded that the U.S. looks at the entire continent as a large island, like a fortress it can isolate and use as a platform to fight from, in case another power challenges its planetary superiority. But for this "large island" to be impenetrable, invulnerable and self-sufficient, its natural resources are essential. Ceceña analyzes the steps that the U.S. has already taken to achieve that objective. The crew of Nimitz-class aircraft carrier USS John C. Stennis. The first was economic: with neo-liberalism, the U.S. rearranged the use of natural resources to benefit large multinationals and other political and economic groups. Due to the failure of the Free Trade Area of the Americas, it was not entirely successful. The second was legislative. It had Latin American constitutions - which were very nationalist - changed to allow the entry of foreign private capital and the shrinking of state interference. The third was military: the U.S. pushed for the approval of security laws that in some cases allow the free movement of the FBI or the CIA on our territory. With the Fourth Fleet (and if the U.S. leaves the Ecuadorian base at Manta) it will have itinerant military bases with ships equipped with every instrument and communications systems to intercept other ships as if they were a complete military base. With this control, the U.S. not only ensures its access to our region, but it impedes the entry of other competitors (which also serves to ensure its perpetuation as a power).